Families have been told they will have to grow more of their own fruit and vegetables to cope with food shortages. 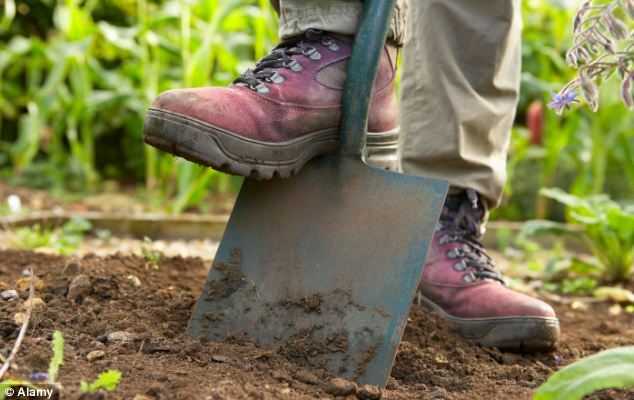 Farming minister David Heath recast the famous World War Two slogan urging Brits to ‘dig for victory’ with a stark warning of the need to ‘dig for survival’ in the future. New figures today showed fruit prices are more than 10 per cent higher than last year with vegetable costs up 6.7 per cent. Mr Heath warned Britain could not rely on cheap imports to meet its food needs. Disruption to the food chain triggered by disease, conflict or bad weather hitting harvests would drive prices even higher. Britain is on the verge of running out of wheat after a year of terrible wet weather, with more than 2million tonnes lost in last summer's deluge. Farmers have also struggled to sow crops for the 2013 harvest, which is already predicted to be 25 per cent down on potential production. Households will have to consider becoming more self-sufficient to limit the impact of high costs and bare shelves, Mr Heath warned. He said: ‘With an increasing population, increasing demand not just in this country but across the world, we are going to have to increase food production. ‘We made a huge mistake a few years ago when the idea got around that we didn't need to produce in the agricultural sector any more, that we would be able to buy our way through whatever was necessary to feed the country. 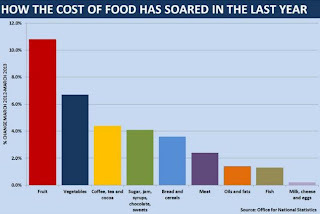 New inflation figures published today show how food prices have impacted on the cost of living. 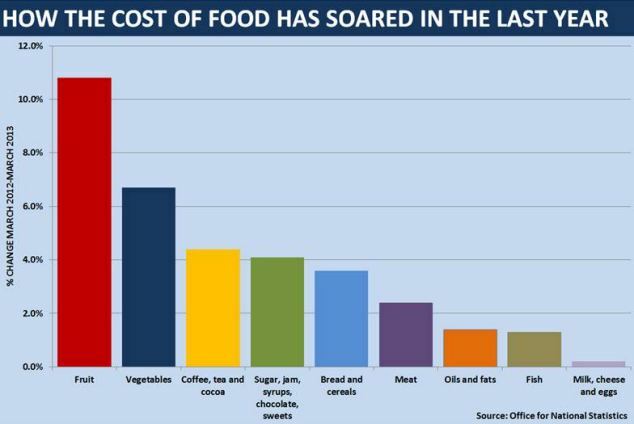 While the headline Consumer Prices Index figure remained unchanged on 2.8 per cent, a detailed breakdown showed how food costs have leapt in the last year. In March 2013, fruit prices were 10.8 per cent higher than in the same month last year while vegetables were up 6.7 per cent. Bread and cereals have risen by 3.6 per cent, meat 2.4 per cent and items like sugar, jam and chocolate were 4.1 per cent year-on-year. Mr Heath told the Daily Telegraph that that the idea of the public ‘digging for survival’ was ‘not overstating it by a lot’. He added: ‘We need to be able to produce enough to deal with the requirements in this country. Food security is going to be an issue of increasing relevance. He suggested that the use of genetically modified crops could be significant in securing food supplies in the future.